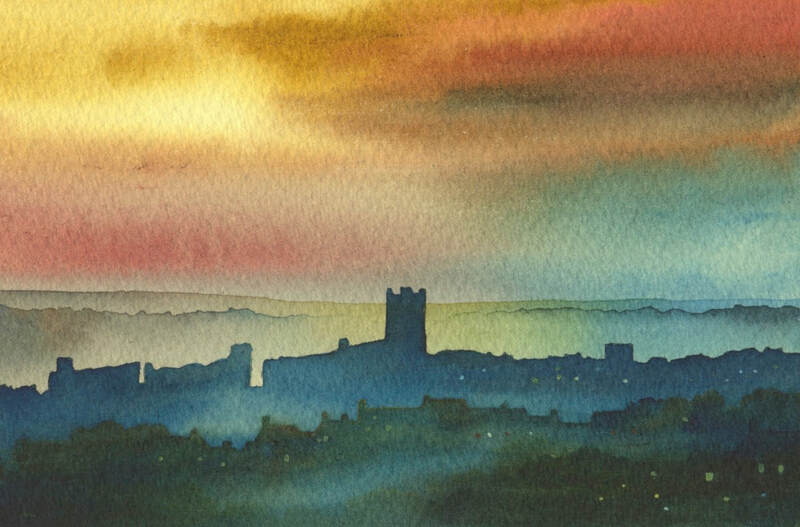 ​If you like my painting style and the atmosphere I try to create in a picture why not commission a painting? I'll talk through what you would like - viewpoints, colours, atmosphere, where it will be displayed and, of course, your budget. The charge for a commission is usually no more than for a painting created for an exhibition. to establish that what the artist will paint for you is what you want. If you have an idea for a special painting please fill in and send the form at the foot of this page. "WOW! Both are absolutely beautiful, the colours look perfect.....​They are stunning!" "Created as a 60th birthday present for the proprietor of a motor company, this painting (one of a pair of commissioned pictures) of the Three Peaks was a pleasure to paint. This area was where I first got to know the Yorkshire Dales over 40 years ago. I always get a thrill going back there." "I really like the way you have captured the sweep of the hills, Great Whernside and Little Whernside, the sky and the feel of the location." "William's family farmed at the head of Nidderdale, Yorkshire from 1537 until 1880, when the land was acquired to create a reservoir. Now lost beneath the waters of Angram reservoir, William asked me to paint the surrounding hills as they are now, and to recreate the farm from old photographs. I spent a quite a while in a blustery October sketching the landscape and completed the paintings in the studio. The picture now hangs on a wall in Colorado - a present for William's 7 year old grandson and a link with his family's past." "Thank you once again for the commission. It is really beautiful and my mother will love it." "Wendy's mother and father lived overlooking this view of Richmond in North Yorkshire for the first year of their marriage. As a reminder of their happy memories of that time Wendy commissioned a painting of the view for her mother's 80th birthday. A few days later I was sitting on the grass and sketching the view (which also happens to be one of my favourite views) of Richmond and its iconic castle." "My Dad and Brother recently commissioned you to paint Coverham Church for me as a 40th birthday present. I got the painting last weekend and I just wanted to write to you to tell you how utterly delighted I was when I received it. It is simply beautiful, made me cry and is now pride of place on the living room wall. Thank you for capturing such a magical, beautiful, peaceful and utterly personal place so wonderfully. Quite simply one of the best presents I have ever received!" "A father and his son contacted me to paint a picture of the gates of the church where their wife and mother had been buried. 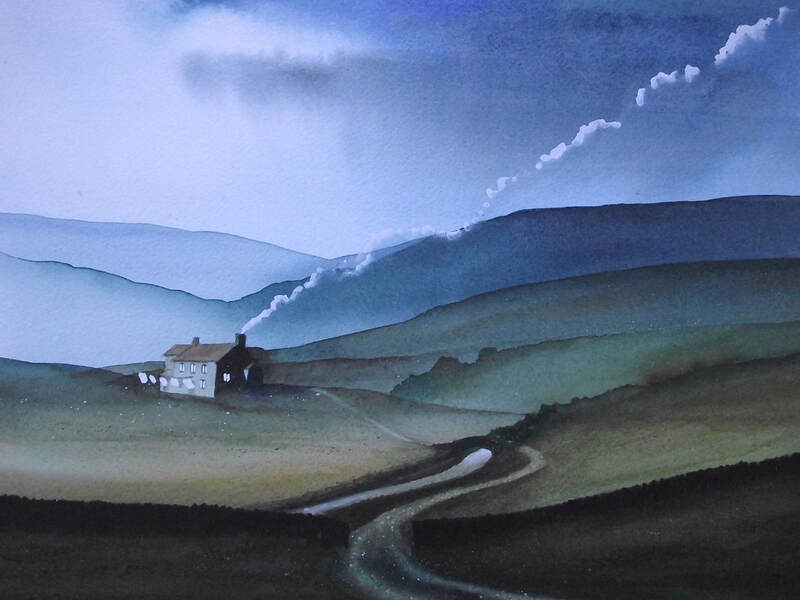 This quiet corner of the Yorkshire Dales has long been special to me and I was delighted to be asked to undertake the commission. It was a glorious summer afternoon when I sat down with my sketchbook to draw. There is great ghost story about this place - a black veiled woman walks here in search of her lover - but sadly she didn't show up that day!" "Queen Mary's School is set in a Georgian manor house in the lovely surroundings of Baldersby Park. 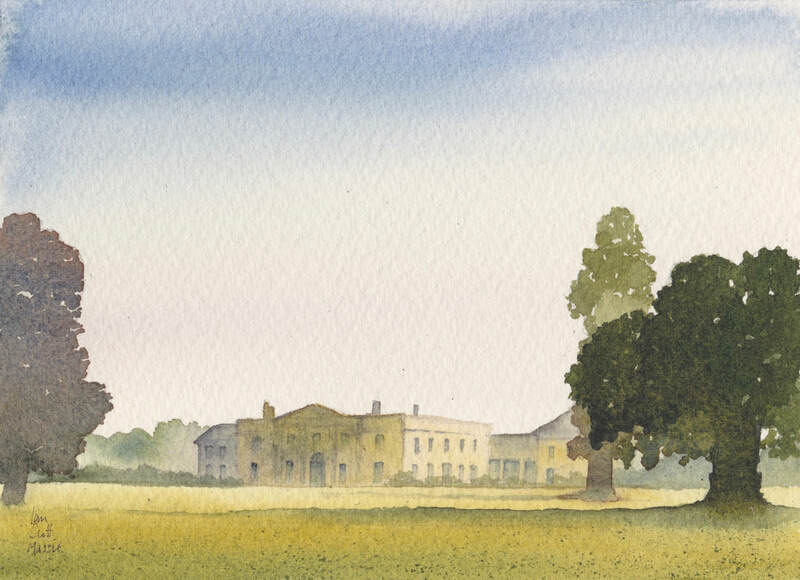 With her retirement approaching, one of the teachers contacted me about capturing her workplace in watercolour - and to make sure I included one of the famous ancient oaks. Surrounded by a loud chorus of curious sheep I drew the view, thinking about the palette of colours which would capture the softness of this quintessentially English landscape. Back in the studio the little painting came together quickly and was enthusiastically received." The form below allows you to start the process by getting in touch and giving an idea of the size of painting your budget will cover. All my work is completed in artist's watercolour pigments on professional quality watercolour paper and the resulting picture is presented mounted and ready for framing. The first step is to have a conversation, in person or by email, about your picture - the subject, size and colouring - from which I proceed to make some sketches to explore your ideas. Its often a good idea to supply a photo or two of the subject if there is a particular viewpoint you prefer. I try to complete commissions in about 6 weeks, but this is dependent on my exhibition schedule and may vary - but you will be kept informed should there be a delay. Payment is by BACS bank transfer and takes place one the initial sketches are approved. If you would like to commission a picture please complete and send the form below and I'll look forward to discussing it. Other sizes are available - please enquire. Framed prices will vary according to the framing chosen. If you are able to collect your painting, framing is available through the excellent service offered by Masham Gallery. For paintings which require posting the picture will be supplied unframed. Enquiry to commission a painting.